Americrest Luxury Homes is creating inspiring residential lifestyles in Florida’s most desirable locations. The company’s exclusive collection of carefully crafted homes envelops outstanding design to create unique surroundings. 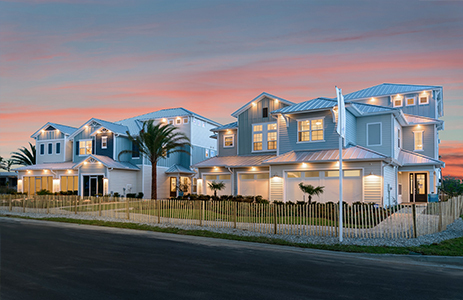 At Beachwalk, Americrest’s exclusive selection of two story homes, some with optional third stories, offer inviting open floorplans highlighting a plethora of elegant features and appointments with incredible beachfront views overlooking a 14 acre Crystal Lagoon. In addition, Americrest Luxury Homes at Beachwalk offers thoughtful options such as private elevators, built-ins, oversized garages and granite countertops, rainfall showers and much more. Prices start from the low $500s to over $1 million. This does not constitute an offer to sell, or a solicitation to buy, real estate to residents of any state or jurisdiction where prohibited by law, or where prior registration is required but has not been fulfilled. Stated square footages are approximate and should not be used as representation of the home’s precise or actual size. Floorplans, site plan, features, options and elevations are artist’s renderings and are proposed and may contain options, which are not standard on all models. Americrest Luxury Homes reserves the right to make changes to these floorplans, specifications, features, dimensions and elevations without prior notice. No guarantee is made that proposed or planned features will be constructed or that if constructed, the number, type, size and location will be depicted. Access to and rights to use certain areas may be restricted. Void where prohibited by law. Equal Housing Opportunity.